Less-than-truckload carrier utilizes Samsara to support ELD compliance, routing and dispatch efficiency, safety programs, and preventive maintenance for its 545-vehicle fleet. 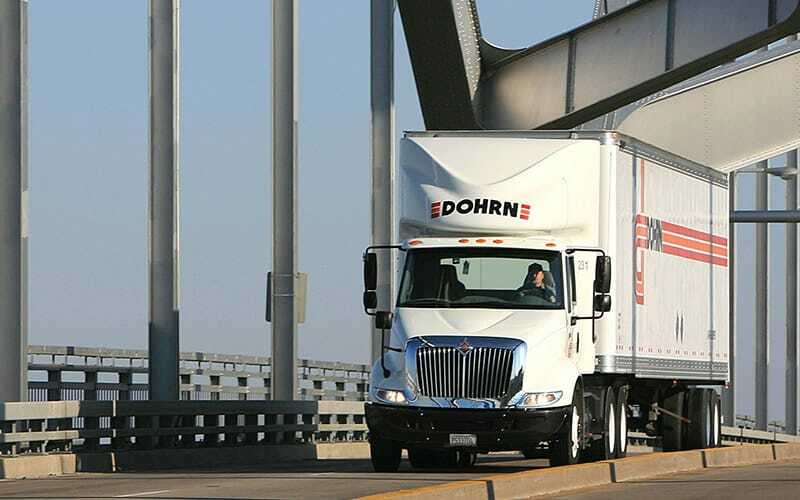 Headquartered in Rock Island, Illinois, Dohrn Transfer traces its roots back to 1921, when Charles Dohrn started the company with one wood slatted truck and a single route. Today Dohrn has 20 terminals and offers trucking services and local delivery throughout a 14-state service area. With 470 tractors, 75 straight trucks, and 645 drivers, Dohrn prides itself on utilizing powerful logistical tools and showcasing excellence in service. 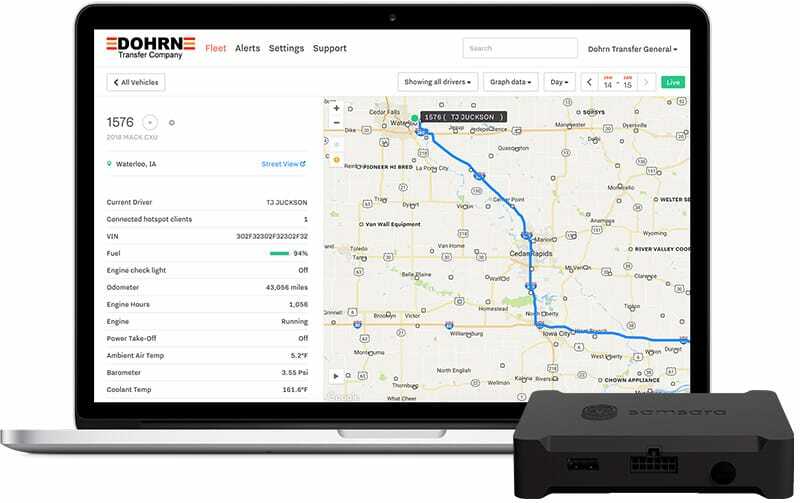 Dohrn Transfer is subject to Hours of Service regulations (HOS) and needed to find a solution for ELD compliance. Importantly, Dohrn’s leadership wanted the new technology to accomplish more than just providing HOS information—they wanted it to support broader business initiatives. 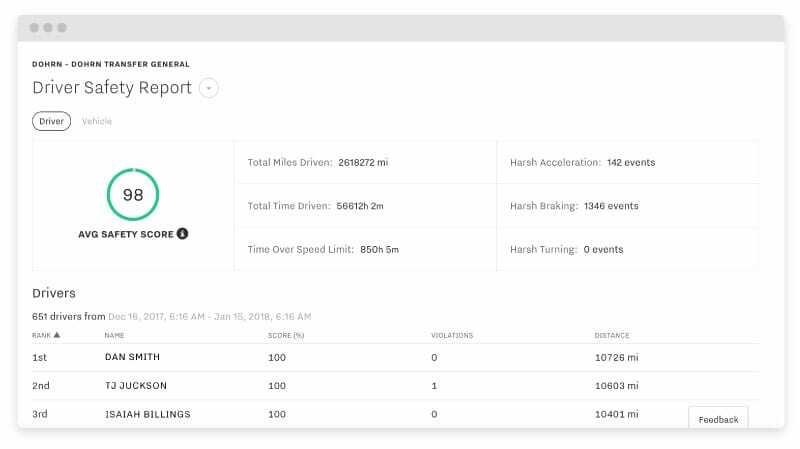 When the Dohrn team evaluated Samsara, they recognized the value of the integrated fleet platform, including sensor data reporting live GPS, maintenance diagnostics, fuel usage, and driver safety events. “With Samsara we quickly saw a ton of additional operational benefits in terms of efficiency and safety, which excited us,” said Michael Leathers, VP of Administration at Dohrn. But one of the most important factors in Dohrn’s decision was ease of use and employee engagement, which Leathers believes to be critical to the success of any new technology program. The Dohrn team could picture Samsara at the heart of the organization, helping the company to improve safety, reduce hours spent on paperwork, optimize maintenance, and enhance dispatching efficiency. With that vision in mind, Dohrn deployed Samsara vehicle gateways (VGs) in every Dohrn truck. Adam Hoste, the team’s Operations Technology Analyst, was responsible for rolling out the solution and onboarding Dohrn’s 645 drivers across 20 locations. In the process of guiding the roll-out, Hoste became intimately familiar with how Samsara is impacting Dohrn across all parts of the business, and he’s proud to summarize other ways Dohrn is saving money through Samsara. 50% reduction in idling after seeing idling reports in the Samsara dashboard and implementing a coaching program to cut idling time by half. $200,000 annual savings on cellular data plans by relying on Samsara’s built-in WiFi hotspot to connect the tablets used to process pickups and deliveries. Saving two days per week in administrative overhead plus additional hours auditing and assembling reports, by automating IFTA reporting. Dohrn is also using Samsara VGs to capture accurate mileage on the trucks they rent—an average of five trucks each day to fill in gaps in the fleet. In the past, drivers often forgot to record their mileage, which caused IFTA reporting problems and overage charges. Dohrn handles local pickup and last-mile delivery alongside their terminal-to-terminal routes, and dispatch administration has significantly improved since deploying Samsara. As customers make requests throughout the day via web forms and calls, Dohrn dispatchers are responsible for assigning drivers to meet every appointment. Before Samsara, the team had to estimate when drivers might return for their next load, or they had to call drivers directly. Now the team relies on Samsara’s live-to-the-second GPS location tracking and easy search by truck number to make better hour-by-hour decisions about who to send where and how to plan the day. Dohrn uses sensor data from Samsara as the foundation of a safe driving coaching program based on HOS violations and harsh braking. Dohrn subscribes to the Smith System principles for defensive driving, and managers use feedback forms to coach drivers on the appropriate defensive driving techniques to address challenging situations they encounter. Sandra Rose-Brown, Manager of Fleet Maintenance across all eight of Dohrn’s maintenance shops, also has safety top of mind. “Maintenance is all about safety, that’s our top priority,” she said. Drivers never want to send their trucks to the shop, she explained, and often there was no follow up on paper logs of unsafe vehicles until it was too late.